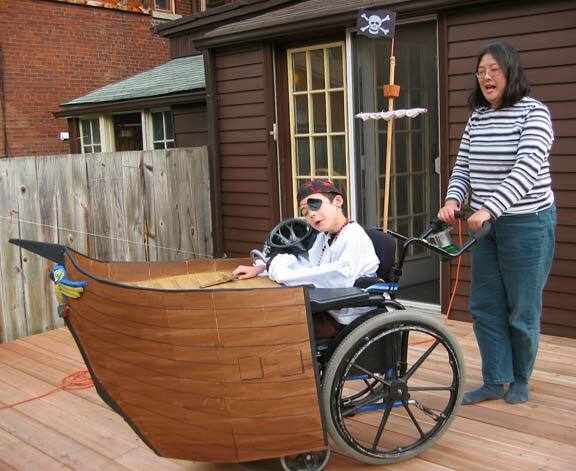 About three weeks ago, Jon announced he wanted to be a pirate for Hallowe’en. Bachan had brought him some pirate gear (hat, hook, eyepatch–standard pirate issue). 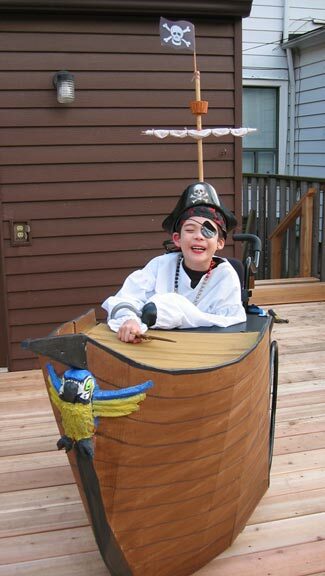 So, in true nautical spirit, we went a little overboard to incorporate his wheelchair. Puffy shirt fashions by Laura (she created the pattern and sewed it), and the shortened sails too. Our previous Halloween wanderings have always been short–large groups of people are always hard for Jon. But this year he had been counting down the days and hours and we ended up hunting for swag for slightly more than an hour! Jon had several catchphrases memorized, too: who would not be terrified by the dread pirate chirpily yelling: “Arrrrr!” (which came out more like “Harrrr!”), “Shiver me timbers”, and the ultra-cute “Yo Ho Ho and a Bottle of Pop!”. Very cool costume and custom rig! Jon, wicked costume! Auntie Laura and Uncle Peter did a great job. Can they make my costume next year? Very cool costume, but where are the weapons? How can he be a pirate without cannons, and a blood-soaked cutlass? And where is his bottle of gunpowder-laced rum? Next year, parents, lets make Jon a proper menace to society. Jon is saying “Arr”, so he’s doing his part. I’m looking forward to hanging out on the next “Talk Like A Pirate Day”. Apologies, I didn’t see the gunports painted on the side there. You are good parents after all. He also has a little dagger in the pics, though it’s hard to see. I admit, though, for the actual voyage we ditched both the dagger and the hook. Just as well–he was so tired by the end of the evening he kept putting his head down on the deck to rest and probably would’ve poked his eye out. …which would have been perfectly fitting, given that we already had the eyepatch onhand. And Andy would have given us brownie points for verisimilitude.